Net neutrality is viewed by many as a bright spot in the otherwise rather dim and confused tech policies of the United States, and its enemies are subject to the harshest disdain. How, many ask, could anyone oppose such a simple, common-sense measure, except out of ignorance, avarice or both? In fact, the maneuvers we see playing out today are part of a complex dance of dispute that has been going on for quite a long time — longer than you might think. All the same, we have arrived at a tipping point for the internet as a whole, and crowding the fulcrum of the balance of power are two agencies: the Federal Communications Commission and the Federal Trade Commission. These organizations, so reliably effective and reliably banal, after toiling in the background for decades, have suddenly become visible at the forefront of a conflict that may change the nature of the premier tool of the digital age. In order to understand what’s happening to the internet today and how we can keep it free and open in the future, we have to consult its past. It’s remarkably hard, however, to find that past in a single narrative thread, with a minimum of legal and technical jargon. That’s what I’ve tried to create with this series, Commission Impossible. Are you sitting comfortably? Then let’s begin. By way of a brief introduction, let’s just set the two agencies side by side and observe their differing but complementary missions. One more difference worth noting at this point is that the FCC creates guidelines that proactively shape the behavior of the industries it regulates. The FTC, on the other hand, is a reactive agency: bad behaviors are brought to its attention, and it pursues the perpetrators and punishes them. They both have their place; think of it like the difference between drawing lanes on a road and issuing speeding tickets. We begin with an important case. The FCC was looking into a situation where a carrier offered communications service to customers, but was taking the opportunity both to restrict what customers could do with their home connection and to advance its own data services that were essentially over and above the basic service. A familiar situation. 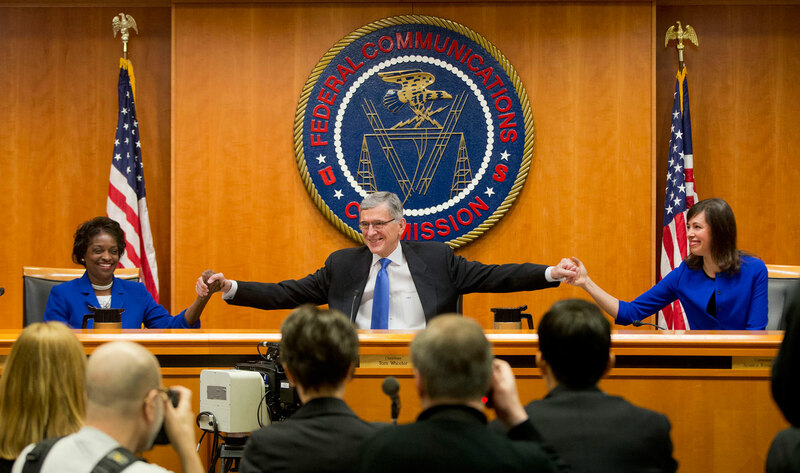 The conclusion reached by the FCC was that there were fundamentally two services on offer. One, moving data from one place of the customer’s choosing to another, and two, providing processing or storage services for that data. The former, the FCC declared, was a telecommunications service, while the latter was an information service (you’re going to be seeing these terms a lot). These things are regulated differently, so therefore companies that offered both must maintain “maximum separation” between them to avoid conflict. Sounds like it could have been, say, Comcast a couple of years ago, right? In fact, this was in 1966 — the first of several “Computer Inquiries” that marked the FCC’s early attempts to parse what was even then a tumultuous and fast-moving industry. The company was AT&T, whose acknowledged monopoly at the time was subject to monitoring by the FTC. 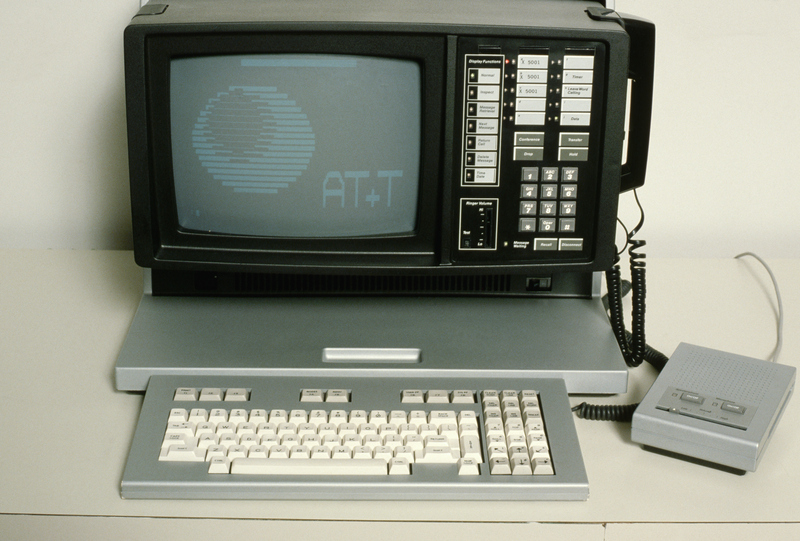 An AT&T computer telephone system like those concerned in the Computer Inquiries. Are the service offerings of the common carriers, as well as their tariffs and practices, keeping pace with the quickened developments in digital technology? Does a gap exist between computer industry needs and requirements, on the one side, and communications technology and tariff rates and practices on the other? …there is a potential for abuse in the form of a commingling of costs associated with the rendition of communication and data processing services, which can give rise to the above-discussed problems of cross-subsidization and other unfair competitive practices in the pricing of regulated and non-regulated services. This was the beginning of a jurisdictional negotiation that would last for decades — and is still in full swing today. The magnitude and complexity of the telecommunications industry has ensured that the two agencies are frequently in contact, exactly for questions like the one addressed in the 1966 computer inquiry. Was AT&T encroaching on the fairness of its telecommunications services with its business tactics, and thus (perhaps) deserving of FCC scrutiny? Or was the inverse true, its dominant position in the telecoms market merely a platform from which to launch those unfair tactics, thus becoming a target for the FTC? This once-obscure distinction between information services and telecommunications services, and the resultant division of duties, is at the heart of the conflict today. At the time (and after a bit of negotiation), the answer was a little bit of both. When it was acting as a telecommunications service provider (a type of “common carrier,” a term we’ll get to later), AT&T was expected to play by the FCC’s rules, and when it was acting as a provider of information services, it would have to meet FTC standards. A tentative and somewhat indistinct line to draw, but a line nonetheless; after all, if it qualifies as neither, it escapes regulation by either authority. If it was both, well, that meant more paperwork to be sure, but consumers were safer. This once-obscure distinction between information services and telecommunications services, and the resultant division of duties, is at the heart of the conflict today — although, as we’ll see, that conflict has grown large enough to serve as a proxy battle in the broader war of partisan politics. For now let’s skip ahead to the more recent past: just before the turn of the century. The internet and web are in a time of transition — more than usual, anyway. The ’90s had seen the genesis of companies like America Online, CompuServe and Prodigy. These companies embodied the early internet: chatrooms, email and news managed and operated by a private company. As the millennium approached, the cracks in that wall had started to spread. You dialed in on a phone line (once mom or dad or sis had hung up) and, after a bit of ear-splitting noise, accessed what we would now call a walled garden of content and maybe a bit of the real web. For the most part, there was a nice thick wall between telecommunications services and information services: you got your phone line from one company and your data from another. But as the millennium approached, the cracks in that wall had started to spread. Cable TV had become increasingly common, and cable providers found something wonderful — you can send data through those cables! So they decided to get into the internet connectivity business. Telecoms, sensing this convergence from the other side of the wall, wanted to provide broadband and content services as well. In the interest of spurring innovation and promoting competition, the 1996 Telecommunications Act was passed, with the intention of letting pretty much any company get into any aspect of the communications business. 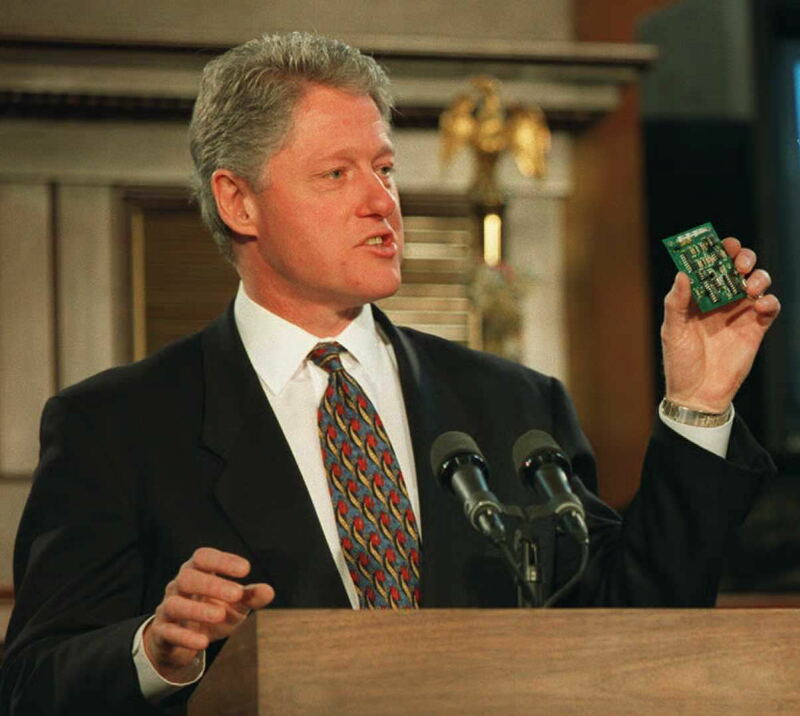 The V-Chip automatic content monitor held by President Clinton as he discussed the Telecommunications Act of 1996 should tell you something of how different things were then. As you can imagine, the story of the industry only gets more complicated from here. It also introduces some important terms that you’ve probably seen around: Title I, Title II and common carrier. I’ve deliberately avoided using these, because they’re sort of redundant legalese for the things I’ve already been talking about. For now, you can consider information services as falling under Title I, and telecommunications services as falling under Title II — as what are called common carriers. Don’t worry too much about that, though: Whatever we call it, the dichotomy between moving data and providing or modifying data is still the key difference. Once you get that nailed down, the correct agency just does its job and enforces the appropriate rules. Unfortunately, the increased competition envisioned in 1996 didn’t really happen. Instead (though not necessarily due to the Act) we saw connectivity and media companies engulf each other, forming enormous conglomerates like AOL Time Warner and Comcast NBC Universal. Broadband services were also becoming more common, and conflicts were cropping up similar to those addressed back in 1966. What if, for example, Comcast provides you with connectivity services like broadband, information services like email, but also TV service? And smaller ISPs argued that if cable is telecommunications infrastructure (as they argued it was, and cable companies swore it wasn’t), they should have access to certain physical portions of it, as the law requires for other telecoms’ poles and facilities. If the company starts loading the dice, does the FTC step in to correct Comcast’s business practices, or does the FCC address its transmission practices? What if Comcast provides you with connectivity services like broadband, information services like email, but also TV service? The FCC took on this question in 2002 and made the determination that, according to the wording of the 1934 and 1996 Acts, cable internet was still an information service and therefore not under its jurisdiction — unlike DSL, which was still classed as telecoms. This didn’t go over well with some, and they sued. A court rejected the FCC’s decision, finding that cable internet was clearly both telecommunications and information service. But the case went to the Supreme Court, which in 2005 reversed that decision, finding that the FCC’s classification was a reasonable interpretation of the law — if not the only one. Confused yet? This is an important point in the history, so let’s go into it a bit more. The Supreme Court’s decision is known as “Brand X,” (think of the name like a corporate “John Doe”) and it solidified broadband’s status as an information service — but with two major caveats. First, it wasn’t decided by the court that any law defined broadband that way, but that the law empowered the FCC to do define it. So the court had deferred to the agency and its choice. Second, it is impossible to proceed without mentioning Justice Scalia’s dissent. He argued it was ridiculous to defer to the FCC’s decision when it was clearly wrong; cable internet was obviously a telecommunications service to anyone who wasn’t a disingenuous lawyer. He used the metaphor of a pizzeria to illustrate this. Not very convincing, right? Scalia shared your opinion. Scalia makes a lot of sense, and despite his being in the minority opinion, this was a strong argument for the classification of broadband internet as a telecommunications service — one we’ll be seeing again. Complicated, right? One day the industry wants this, while another industry wants that, then they switch places. One day a judge says this, another day another judge says that, then the next year it’s the other way round. I’m including all this stuff so you can see how much back-and-forth there’s been, but don’t get too bogged down in the details. When you zoom out a bit it really is just squabbling over whether the FCC or the FTC has to step in when something shady is going on. And the rule of thumb is this: industries always lobby for whichever option would give them the least trouble. The rule of thumb is industries always lobby for the regulator that would give them the least trouble. At any rate, the FCC was fine with broadband being an information service for now, though, because it felt Title I of the Communications Act gave it a little power over information services if it was “encouraging broadband deployment and preserving and promoting the open and interconnected nature of the public internet.” So even if a company wasn’t normally FCC business, they could exercise this “ancillary authority” (as opposed to “statutory authority,” explicit in a law) to reach out and touch it — supposedly. It wasn’t for a few years that this power was really put to the test. The FCC told Comcast to stop throttling BitTorrent traffic in 2007, and Comcast took them to court, saying hey, you don’t regulate us. Believe it or not, the case took three years to settle. And in 2010, the court basically told the FCC that its so-called ancillary authority was bunk. If you don’t have a proper law saying you can regulate information services, the court said, you can’t just apply one you think is close enough. This basically exempted broadband companies, which the FCC had itself opted not to consider telecoms in order to save trouble, from their oversight altogether! The FCC had played itself. Now, you may remember that a lot happened between 2007 and 2010. Mobile and landline broadband continued to explode, smartphones were changing the consumer landscape and a new president had stepped in, bringing with him a new FCC Commissioner and a new set of priorities. Among those priorities were expanding broadband access and creating some kind of net neutrality framework, which had been discussed for a decade and even proposed in Congress, but no one had yet made stick. And unfortunately, the Comcast case had clipped the FCC’s wings but good. Now, for a while, the FCC considered taking the L, fading into the background and just letting the FTC do its thing. They had no beef with the other Commission, just a few run-ins here and there over borderline cases. But there was one big problem with letting go. Not that the FTC wasn’t going to do its job, but that it wasn’t going to do the job that needed doing: establishing strong, proactive net neutrality rules. The FTC was doing its job well, it just wasn’t the job that needed doing. The new Chairman, Julius Genachowski, had two options for doing it. One was to reclassify broadband as telecommunications, but he was worried this would rock the boat, and rightly so. But it was on the table for all that. Ultimately he went for a gentler approach with a part of the Telecommunications Act called Section 706, which calls on the FCC to take actions encouraging timely broadband deployment. His argument was that a “virtuous cycle” of good business practices and consumer trust would drive demand and increase adoption, and strong net neutrality rules would promote that cycle. Let’s just admit right now that this is a pretty big stretch — it’s like saying that because you’re responsible for keeping the streets clean, you should be made mayor the better to do so. It was another setback for net neutrality rules, since it was another source of statutory authority found wanting. Around this time three influences came together. First, there was yet another new chairman at the FCC, Tom Wheeler. Wheeler, who had headed cable and wireless industry associations, was accused of being a telecoms industry plant — though those accusations would ultimately fall extremely wide of the mark. 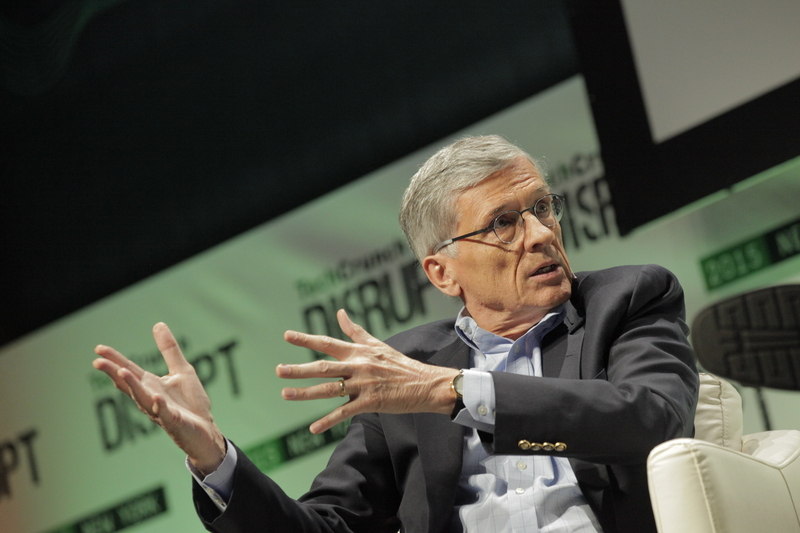 FCC Chairman Tom Wheeler at Disrupt in 2015. Second, 2014 was a bad year for the Democrats: they’d lost big at the midterm elections, and they needed a win. Third, President Obama was thinking hard on his legacy — the big stuff, not all the thankless little laws and orders that benefit many but are remembered by few. He had the ACA (which, though it might soon be dismantled, had set bars that would be difficult to lower), he had some good civil rights stuff, but what he really needed was something lasting for the internet. Net neutrality was the obvious choice — and if we’re honest, he’d promised years earlier to do it and never got around to it. So his administration set about looking at how they could get it done, and done right. This is the point where you hear about a “shadow FCC” that began forming its own net neutrality rules within the executive — and it’s probably at least partly true: time was short, and the administration needed to make a case and hand it over fully formed. The FCC is an independent agency and under no obligation to accept any plan authored by the White House — but if the plan was good, why not collaborate? And make no mistake, the plan was good. It was very good. Part of why the industry was and remains so livid about all this is just how good the plan was. In February of 2015, the FCC issued the Open Internet Order we now know that instituted net neutrality. Its critics called it an unprecedented power grab — and they’re half right. It was a power grab, all right. But unprecedented is exactly the wrong word to describe it. First, the FCC pointed out that, counter to what some industries liked to claim, it had long ago broken the seal on applying “telecommunications” classification to internet access. That would be back in 1966, and definitions established in that case and its follow-ups are still in play. In fact, up until 2005, DSL was still considered telecommunications and some providers had fought to keep it that way! Then the Commission brought up how they had voluntarily classified broadband access as an information service instead of a telecommunications one. In 2005, the Order points out, the Supreme Court explicitly said that they would defer to the FCC’s classification decision either way, since the law as written permitted both interpretations. So, the FCC continues, the Supreme Court said it’s up to us, and that decision is still in force. Back then we said it was an information service. Times have changed, and so have our minds. Now we’re saying it’s telecommunications. Don’t like that decision? Perhaps you remember Scalia’s dissent. He said that broadband was obviously a telecommunications service, and that’s how it should be classified. This is the best part. Because the Supreme Court already deferred to the FCC, their decision automatically carries that authority. 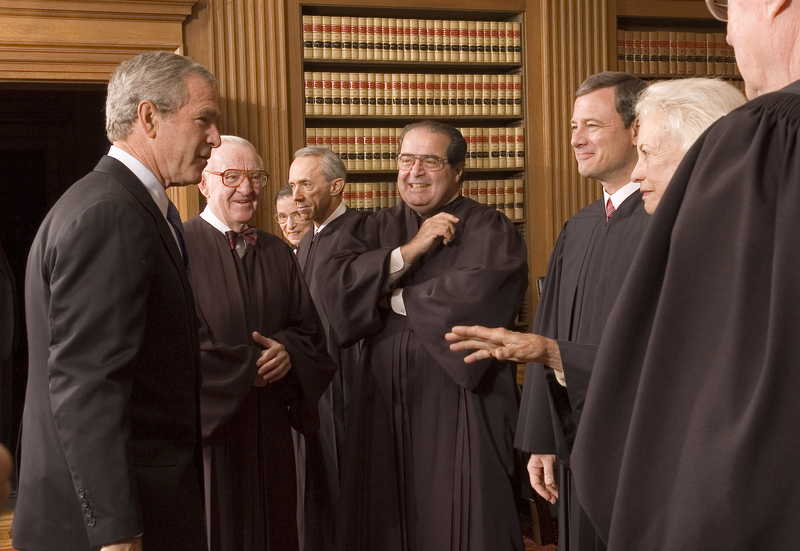 And because of Scalia, no one can argue that this reclassification is against the spirit or letter of that decision! And then, the FCC says, about that Comcast thing and the virtuous cycle we tried to create. Remember how you said we needed a proper law that specifically gives us power over broadband providers? Because they’re now a telecommunications service, that would be Title II of the Communications Act, the strongest law we’ve got. After being thwarted at every turn, the FCC at a stroke established its authority over internet providers with the ultimate judicial support, a rock-solid legislative foundation, and extensive historic precedent — and while they were at it, established the fundamentals of net neutrality. There was just one little problem: 2016 was an election year. This is the first article in a series about the FCC and net neutrality. Read part 2 here.